Utah Division of Wildlife Resources | Deer: to feed, or not to feed. Deer: to feed, or not to feed. Winter feeding is usually a last resort and not in the best interest of deer. EVERY WINTER, deer face a crisis. This annual event is the single most deadly thing a deer faces during its life, deadlier than coyotes, cougars, and even motor vehicles. As a biologist, it’s my main focus when trying to grow deer herds in my district. Almost every winter brings famine for deer. They are forced to survive on foods that harbor toxic compounds and to spend their summer fat reserves in order to survive until spring. The season is especially deadly to fawns; they use their summer resources to grow, and therefore have very little fat reserves. In fact, in extreme winters, a deer herd can lose nearly all of the fawns. 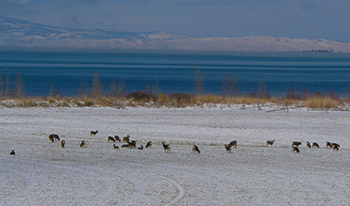 DWR biologists will monitor the conditions and the deer herds through the winter. If the deer need to be fed, biologists will make sure the feeding is done in the right way. Folks often approach me wondering why, given this wintertime food crisis, I don’t recommend feeding deer every year. Many people take it upon themselves to feed deer. On its face, this feeding effort seems like a good idea; however, feeding deer can cause many problems that we should consider. My primary concern is for the overall health and growth of a population. Rather than focusing on individual animals, I ask myself how management actions will affect the population as a whole in an area, and then I weigh the costs against the benefits. Given these considerations, my advice to people is to avoid feeding deer. Feeding should only be considered when exceptional winter conditions present themselves. Deer require very nutritious food in order to survive the winter. They have a four-chambered stomach that is relatively small compared to other species, like elk and bighorn sheep. It’s possible for a deer to starve to death with a stomach full of low-quality feed. Natural forage on winter ranges, like sagebrush and bitter brush, provide great nutrition, but deer have to move around to get enough of it. Another reason we feed deer only as a last resort is because of the spread of disease. Feed sites concentrate deer in a small area where diseases are easily transmitted, which can cause a large number of animal deaths. In fact, in areas where chronic wasting disease is detected, we do not feed deer under any circumstances. Aside from disease, congregated animals at feed sites cause increased competition, and because of aggressive adults, fawns usually suffer the most. This can be complicated further when does eat their fill and fail to take fawns foraging across the landscape. Fawns rely on their mothers to teach them how to survive in their environment, and if a doe is served on a feed row, she’ll often neglect to show her young which natural foods to eat and avoid. Some research suggests that the food a doe eats while pregnant (during winter) can actually cause physiological changes in the fetus that allow it you use natural forage more readily. In this case, feeding can actually be detrimental to the unborn cohort of animals. A final consideration is more philosophical. At what point do feeding efforts diminish the wildness of the animal? As a wildlife biologist, my goal is to provide sustainable populations of deer as a trustee of the people of the state. I work to provide this resource at a level where the animals don’t outstrip their natural resources. A great deal of my time is spent trying to provide winter resources for deer so that they can survive at desired population levels without the need for feeding efforts. Many people believe that there is aesthetic value in the idea of wildness of deer on the landscape. Most winters, it's best to let the deer find their own food. With all of these considerations in mind, there are times when we feel that feeding deer during the winter is needed. I am guided in this decision by the Division’s wildlife feeding policy, which boils down to this: we (DWR officials) will feed deer during unusually severe winter conditions. We step in when feeding can provide increased survival rates of females ensuring that the breeding segment of the population will not be decimated. Taking action by saving these animals increases the likelihood that the population will recover quicker from a severe weather event. Every winter we monitor conditions by tracking snow depths, temperatures and availability of forage plants on winter ranges, as well as fat levels on road-killed animals. If we see a trend toward an unusually critical winter, we will initiate a feeding program. The last time DWR fed deer was during the winter of 2007-2008. We fed deer throughout Cache, Rich, Weber and Morgan Counties. It was a colossal effort, and the volunteers from various sportsmen’s groups were critical to success. Even with these efforts, most of the fawns died that year, but adult female survival was about 70 percent. It is impossible to say how much of that was due to feeding, but we felt like under the circumstances, feeding was warranted. To sum up, the question of whether to feed or not is more complicated than it appears. During most winters, we should let deer use their natural food sources. Because we monitor winter conditions, local biologists will make recommendations to feed deer when conditions warrant the action. This can help us to avoid unintended consequences. There’s more information about feeding Utah’s deer online. 3 Responses to Deer: to feed, or not to feed. 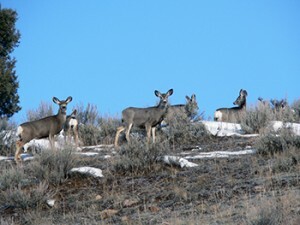 Thanks so much for letting us know about feeding or not feeding the wild Mule Deer. We were concerned, but have determined NOT to feed. They are here in the suburbs, and we want to be conscious of the way we could be detrimental in the population.